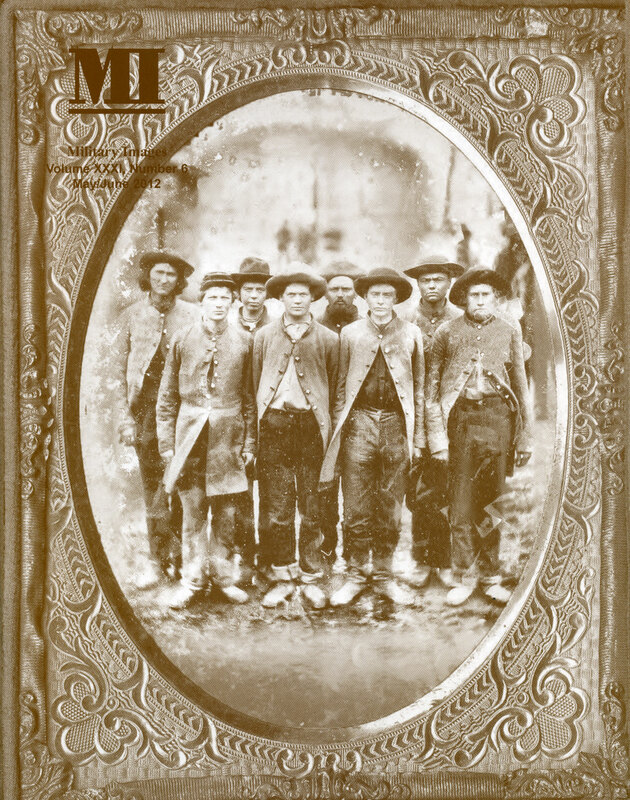 Ambrotype of eight soldiers thought to be members of the Confederate 20th Tennessee Infantry at Rock Island Prison during the winter of 1863-1864. Additional details and information about the image appear on page 38, and a profile of the regiment can be found on pages 28-31. The image is credited to the Battle of Franklin Battlefield Trust. Bugler Roy Jackson, Troop I, 6th U.S. Cavalry, at Fort Meade, S.D., April 6, 1906. Jackson holds a Model 1892 bugle in this image from the Chris Nelson collection. The editor observes that Civil War photo exhibits have always been popular, and notes the April 2, 2013, opening of Photography and the American Civil War at the Metropolitan Museum of Art in New York City. A selection of images from the exhibit is featured in the issue. The editor also notes the passing of legendary militaria dealer, collector, historian, author and longtime MI subscriber and contributor Norm Flayderman on May 23, 2013. The work of St. Louis photographer Enoch Long is well known by the distinctive painted canvas backdrop he used to frame his soldier portraits. Five examples of Long’s work are featured here, including the author’s portrait of Long himself seated in front of the backdrop, and four other images from the Library of Congress collections. A total of 25 “Images from the Collections of our Readers” includes a range of subjects and time periods. Union soldiers and sailors are featured in 12 of the images, and 6 are Confederates. Two are of unknown origin, and the rest of the images are soldiers photographed after the Civil War. To mark the occasion of the blockbuster exhibit, Photography and the American Civil Q&A’s with curator Jeff Rosenheim, MI senior editor Michael J. McAfee and contributing editor David W. Vaughan shed light on how the exhibit came together. Both McAfee and Vaughan were lenders and consultants. Rosenheim noted in response to the question of how The Met decided to mount such an exhibit, “The belief that the medium of photography transformed the war and that the war transformed the medium of photography in interesting ways. Among other things, it established a visual tradition that defined American photography for the next 150 years.” The story is illustrated by seven images from the exhibit. The discovery of a rare outdoor ambrotype of Confederates provides the impetus for this story. 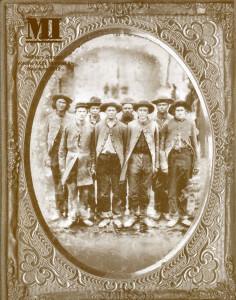 Author Serrano notes, “Recently, an image of several Confederates purportedly taken at Rock Island Prison has come to light and with it a story of one of the most traveled, hardest fought regiments in the Army of the Tennessee, the 20th Tennessee Volunteer Infantry.” The story profiles the respected regiment and includes portraits of six of its members, Pvt. William G. Bryant, Capt. Theodrick “Todd” Carter, Maj. Fred C. Claybrooke, Capt. William G. Gwin, Pvt. John Pritchard and Brig. Gen. Thomas Benton Smith. In “What’s in a Picture? (Or Look Closely! ),” the author reflects on his recent eBay purchase of a carte de visite of an unidentified member of the 13th New York Heavy Artillery. He was inspired to bid on the image because the Hardee hat sitting on a small table next to the soldiers had its normally upturned brim unpinned, and the pin was still attached to the hat body—an unusual detail to be found in an image from this period. Once McAfee had the image in hand, he noticed a number of other surprising details. In “U.S. Navy Pig,” Field examines a carte de visite by American photographer Villroy L. Richardson of about 50 seamen and one pig photographed off Lima, Peru, after 1862. Field describes the uniforms and activities of the men, and speculates that the pig may have been a mascot or more likely a source of fresh meat for the crew. The colonel of the 4th Tennessee Cavalry, Baxter Smith (1832-1919) is shown full standing in this image from the John Sickles collection. Smith was captured on May 9, 1863, near the Caney Fork River in Tennessee, imprisoned at Johnson’s Island, Ohio, and exchanged in February 1865. A series of vignettes of Confederates includes John Van Horn of Spencer’s North Carolina Partisans and the 42nd North Carolina Infantry, John Ross of the 1st Mississippi Partisan Rangers (later the 7th Mississippi Cavalry), Frank P. Peak of Byrne’s Battery (attached to John H. Morgan’s cavalry), Henry H. Curry of the 2nd Kentucky Cavalry and T.L. Kendall of the 1st Confederate Cavalry. Frank Battle of the 20th Tennessee Infantry was the son of the regiment’s colonel, and three of his brothers served alongside him. He distinguished himself in combat at the Battle of Stone’s River and went on to raise a company of cavalry for service under Gen. Joseph Wheeler. Battle was captured in Wilson County, Tenn., on July 29, 1863, and confined at Johnson’s Island, Ohio, until exchanged in February 1865. He ended the war with Nathan Bedford Forrest’s cavalry, and later became a bounty hunter for the state of Tennessee. In this image from the Chris Nelson collection, Spanish American War dead troops are laid to rest. Their identities are painted on the ends of flag covered coffins.